Listeriosis outbreaks caused by eating food contaminated with the bacterium Listeria monocytogenes is often cited as the cause of foodborne illness worldwide, particularly in ready-to-eat (RTE) foods. Listeria can cause illness and even death, lawsuits and prison, and can financially cripple any food handling business found to have spread the disease. "THE ONLY THING THAT BACTERIA LOVE MORE THAN PEOPLE IS PLASTIC (GLOVES)." 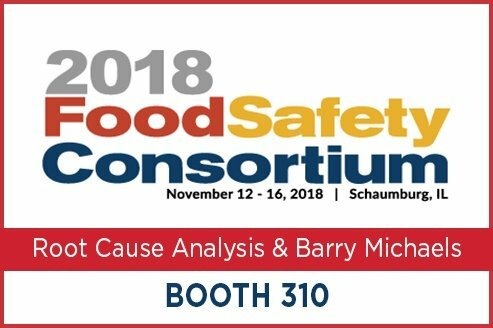 It is not surprising, therefore, that over 15% of foodservice foodborne outbreaks seemed to implicate contaminated gloves as contributory factor in the outbreak (Lynch et al. 2005; Green et al. 2005; Green 2007; Gould et al. 2013). Gloves have been identified as instruments of cross-contamination in experimental work including Listeria spp. disease scenarios (Perez-Rodriguez et al. 2006; Maitland et al. 2013). Studies have shown that worker’s hands and disposable gloves are the most likely vehicle to transfer contamination to any deli surface (Hoelzer et al. 2011; Gibson et al. 2013; Maitland et al. 2013). Clean gloves provide a sufficient barrier from contamination present on bare hands, but contaminated gloves may transfer contamination like bare hands (Todd et al. 2010b; Maitland et al. 2013). The FDA’s Food Safety Modernization Act (FSMA) aims to ensure the U.S. food supply is safe by shifting the focus from responding to contamination to preventing it. Unlike nitrile and latex gloves, vinyl glove molecules are not cross-linked. This leads to more holes in the glove film and high levels of bacteria and virus permeation onto food. Vinyl gloves also have poor resistance to stretch and elongation (based on lower tensile strength and elongation tests) than that offered by nitrile or latex gloves. Less elasticity and flexibility leads to a poorer fitting glove, with more holes occurring during routine use. Vinyl gloves have been described by some as “infection control nightmares,” (Michaels, B. & T. Ayers), and are recommended to be worn for short periods only, and for intermittent or non-food contact areas. Experimental studies have investigated variables in hand cleanliness and glove types, with respect to surface free energy levels and their cross-contamination potential. PE and nitrile gloves showed slight increases in transmissibility when compared to clean hands, latex gloves (no longer used in food handling) doubled that risk and vinyl gloves possessed triple (3x) the propensity to pick-up and transfer microbial contamination and associated carrier soils, compared to clean hands. “VINYL GLOVES POSSESSED TRIPLE (3X) THE PROPENSITY TO PICK-UP AND TRANSFER MICROBIAL CONTAMINATION AND ASSOCIATED CARRIER SOILS, COMPARED TO CLEAN HANDS." It must be noted here that “clean hands/skin” are pristinely cleaned in a scientific setting, and do not take into consideration nails, wrinkles, rings and contact with any dirty surface. One must consider these findings when procuring food service disposable gloves, especially for RTE food departments. 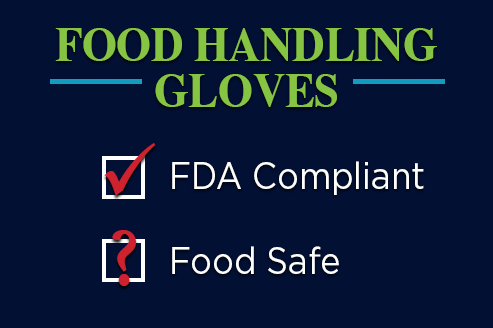 One glove type does not suit all departments, and a variety of glove types in relation to the foods handled and wearer tasks need to be considered. 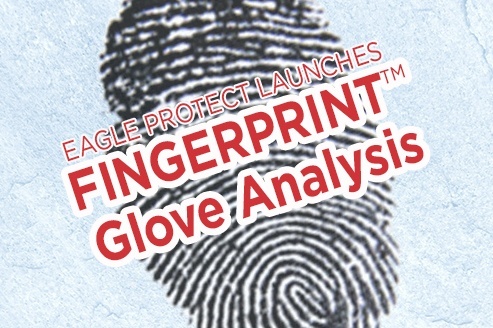 As Food Safety Specialists, with a focus on food safety disposable gloves and clothing, Eagle Protect provides a range of medical examination grade tested gloves for all your food handling departmental needs. For further reading of cross-contamination potential of gloves, please contact us for a copy of the Summary of Hand & Glove Surface Cross-Contamination Potential in Retail Deli, Food Processing & Service Environments Based on Surface Energy Studies, written by Barry Michaels and Professor Christopher Griffith. Full details and references for all the information included here can be found in the complete Glove Hazard Analysis & Mitigation Strategies White Paper, written by Barry Michaels and Professor Christopher Griffith. Contact us for more information.